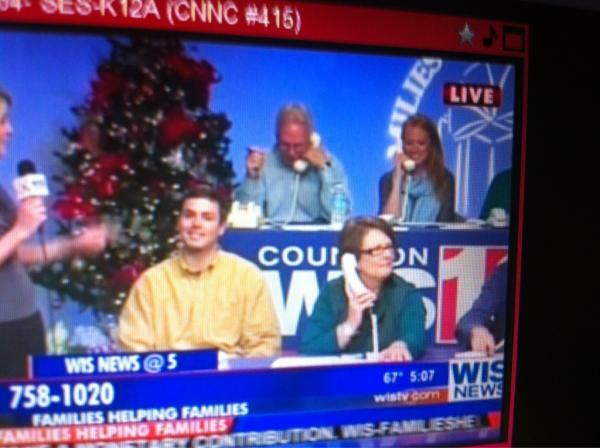 In the spirit of my last post, I enthusiastically said, "yes" when my mom asked me if I would be willing to answer phones at the Families Helping Families charity phone bank on Thanksgiving Day. My family celebrates Thanksgiving on Friday (to accommodate my unpredictable work schedule and my sister-in-law's family dinner), so giving back felt like the perfect way to spend the holiday. I work in television and have been on television enough times for this to not be that big of a deal for me, yet something about being sandwiched in between my parents answering phones on local TV completely tickled me and I could not keep it together. I blame my dad, who screwed up the name of the charity every time he answered the phones, "Family Helping Families? Helloooooo?" Or when he asked me, "Do you think we look fat on TV?" right before the reporter went on air. Regardless, when people ask me how I spent the Thanksgiving holidays, instead of just saying, "I ate too much," I can say, "I ate too much and I was on the local news answering phones and helping people!" Hope you all had a great holiday! If you are in the Columbia area and would like to adopt a family, you can do so here. so cool tv star! :) love it.